Traditional Cantonese style barbecue pork recipe (Char siu) made at home. Marinated and roasted to perfection with savory and sweet Chinese spices and flavors. One of my favorite Chinese dishes growing up was roasted barbecue pork, affectionately called char siu in Cantonese. During our weekend visits to Oakland’s Chinatown, I would always see these beautiful pieces of roasted meat hanging on display in restaurant windows. The magic of this recipe is in the pungent marinade that infuses its lovely flavor onto the surface of the pork, giving a unique ruby color. I want to share with you this traditional Cantonese char siu recipe so you can recreate this delicious dish right at home! Flavorful Ingredients: The flavors are a mixture of intensely concentrated sauces like fermented black beans, soy, hoisin and sesame paste. The aromatic blend of Chinese five-spice adds a kick of pungent flavor and sweet aroma, complimenting the umami taste of the sauces. Sugar is used to balance the saltiness of the marinade, and Chinese sherry called Shaoxing helps to infuse into the pork. Cut: I used pork tenderloin and shoulder for the char siu recipe. I have found that pork shoulder gives the best texture and flavor similar to what I’ve had in restaurants. Cut the pork into long thin strips, so it has more surface area for the marinade to infuse on the surface. Marinate: To achieve maximum flavor and color, I marinate the pork at least 1 hour to overnight ensuring both sides are coated evenly. Some people use red food coloring to enhance the color. I like a more natural color and have found that the honey sesame glaze added on during roasting deepens and adds shine to the pork. This char siu can be made pretty quickly because with lean meat can you roast at high temperatures in the oven. Towards the end of cooking, a delicious honey, mirin, and sesame oil mixture gets brushed on the roasted pork. The glaze helps to enhance the dark red color that is absorbed by the meat from the marinade and gives a nice sweet coating. The sliced char siu is just the right natural color and texture you would expect when you dine at a nice Chinese restaurant. The tender pork will get devoured in an instant! If you have leftovers, you can add it to wonton soup. Roast some extra meat so can try it in my steamed pork bun recipe also called Char Siu Bao. The roasted pork is the star of this dish, so to complement it I like to stir fry some simple Chinese vegetables like bok choy or green beans and serve with some steamed rice. What is your favorite Chinese dish to make at home? How is the dark color achieved on the surface of the Char Siu? The color on the face of the Char siu once roasted is attributed to two steps during the preparation and cooking of the meat; marination and Maillard browning. 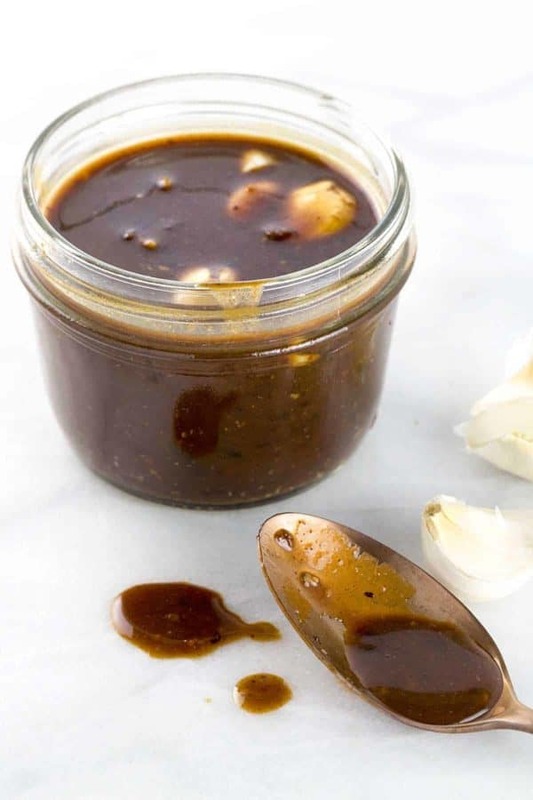 Marinades typically contain acid, sugar, salt, which all help to denature some of the surface proteins to make it easier for the flavors to infuse into the meat, as well as making it more tender. If marinating for a short period, the surface benefits from marination, but not the center of the meat. Maillard browning is responsible for the prized golden brown colors achieved during cooking and baking. When proteins are denatured (structures are broken down) in the presence of heat, the protein recombines with the sugars naturally in food or in added in seasonings. At temperatures between 300° F to 500° F, a browning reaction slowly occurs, creating wonderful meaty flavors and caramel colored surfaces. Traditional Cantonese style barbecue pork recipe (Char siu) roasted to perfection with savory and sweet Chinese spices and flavors. Trim fat and silver skin from the meat and cut into 2 X 1 X 10-inch strips. Combine all marinade ingredients; mix well. Add pork and toss to cover with the marinade. Cover and set a room temperature for at least 1 hour or refrigerate 3 hours, or overnight. Turn every 30 minutes or so. Preheat oven to 375°F. Place a roasting rack on top of a sheet pan lined with foil. Place the marinated strips of pork on top of the roasting rack. Roast the meat on the center rack of the oven for 20 minutes. Turn oven to 450°F. Mix the honey and mirin. 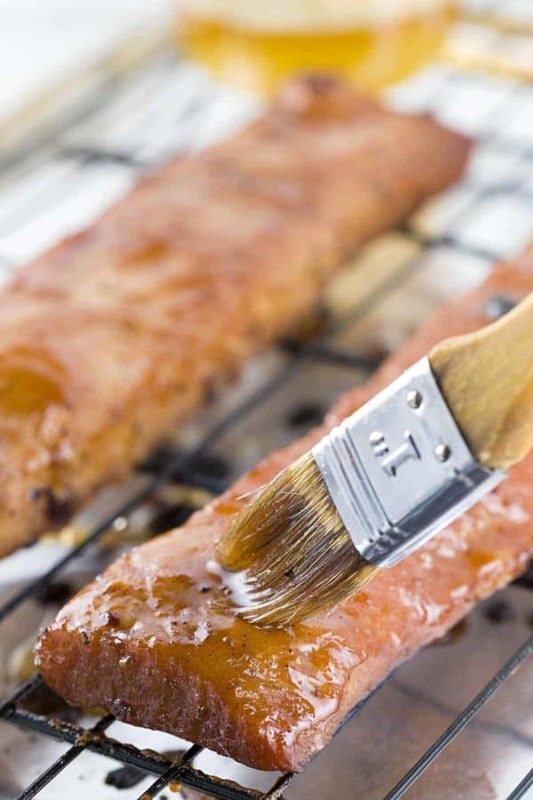 Brush the strips of pork with the honey mixture, and then sesame oil. Roast 5 minutes, then turn the pieces over, brush the other side of the meat. Roast additional 5 minutes. Flip one more time, brush with sauce and sesame oil and roast 2 more minutes. The meat should be cooked to an internal temperature of at least 135-140°F is reached. Slice into 1/4-inch pieces or refrigerate for up to 3 days. Serve the char siu with your favorite vegetables and rice. Oh that pork looks mouthwatering…great recipe and thanks for the awesome tips! Hi Tad! I did some research about the hot mustard sauce for you, and I found that the sauce is typically made from a mustard powder that is mixed with cold water, super simple! You can also add a little bit of rice wine vinegar for some acidity. The spiciness is from the natural chemical compounds in the mustard seeds which are activated when water is added to the mustard powder, it takes about 15 minutes to get peak spiciness, then the spiciness is lost over time, how interesting! Have you tried the S&B oriental hot mustard brand? Thanks for taking the time to share these awesome recipes. Thank you for checking out my website Rick! Visit again soon! Jessica, I used to get Char Siu, and fried shrimp from a local Chinese Take-Away for over 30 years. Unfortunately they closed down and I have never been able to find anything close. This recipe is the best. Many thanks. Just wondering if you ever heard of a dipping sauce that was Tomato based but not as thick as ketchup, and contained a unique combination of spices? It was very sweet, and added so much to the pleasure of fried shrimp. Hi Dan! I’m so happy that you enjoy the recipe! I’m wondering if the sauce you are referring to is sweet and sour dipping sauce? Tangy and very sweet? It’s used a lot for fried appetizers. It very well could be, but is very thin in consistency. Do you have any recipes for this sauce? thank you for this simple but tasty recipe. This recipe is ridiculously delicious and easy! Thank YoU for sharing it! Jessicaa – THANK YOU – great recipe and I made it tonight with riblets – I wrote about your recipe with links to this site here: http://feastforthepalette.blogspot.com/2015/01/char-siu-pork-ribs-and-riblets.html. Thanks for sharing your research and talent! I really like this recipe and was wondering if you thought it would be okay to use pork fillet? Hi Sue- Thank you! Pork fillet (pork tenderloin) would be perfect to use! Just keep an eye out that the pork does not get over cooked since it is very lean. Jessica, thank you for sharing this delicious sounding recipe. I do not eat pork. Can you recommend a meat and cut substitution that would work well with this marinade? Great question Char! I think chicken thighs would be great for this recipe, or even marinating some shrimp and saving some sauce to glaze along with the honey. Yum! Jessica, thanks for this recipe. It brings back childhood memories of going to the Chinese Pagoda restaurant in Reno NV in the 50’s. I plan to make it soon. Another standard dish in most Cantonese restaurants of the time was “pork noodles” in a clear broth garnished with slices on the BBQ pork, green onions and hard cooked egg. Don’t see that anymore, at least not in Ohio! I’ve tried to make them, but they just don’t taste like I remember. Do you have a recipe? I made your recipe last night with pork shoulder. I doubled the portions to have leftovers but the char siu vanished! I will be cooking this dish again.